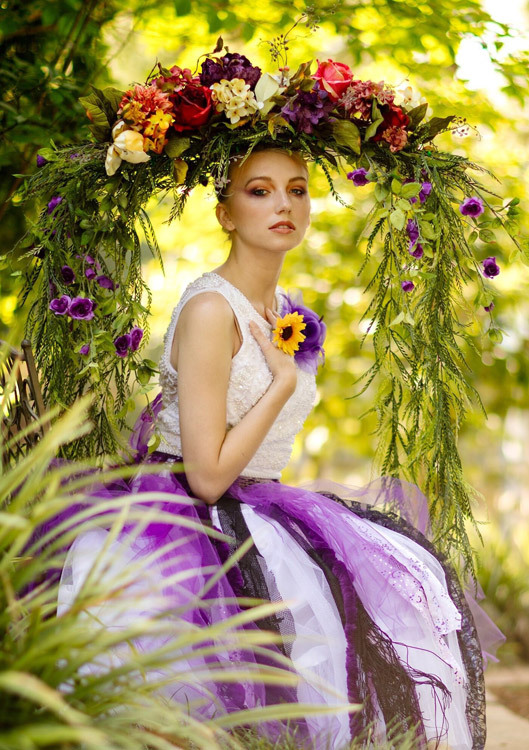 I was inspired by the colors in the floral headpiece that would soon adorn (my model) Khrystyna’s blue eyes. The day before our Avant-Garden photo shoot, I selected my floral color palettes. 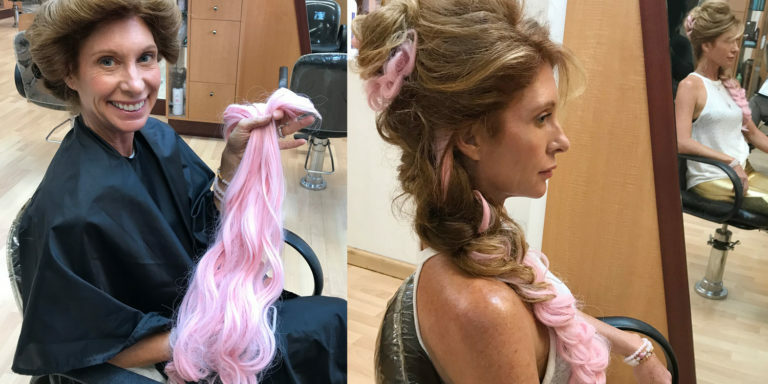 Warm gold, soft shimmering pink, apricot, peachy orange, rose/golds, rust/brown and a cool violet/purple were my selections. For eyeshadows, lips, blushes and bronzers, I love blending a stream of complimentary and contrasting colors and textures (matte, shimmer and metallic) together. 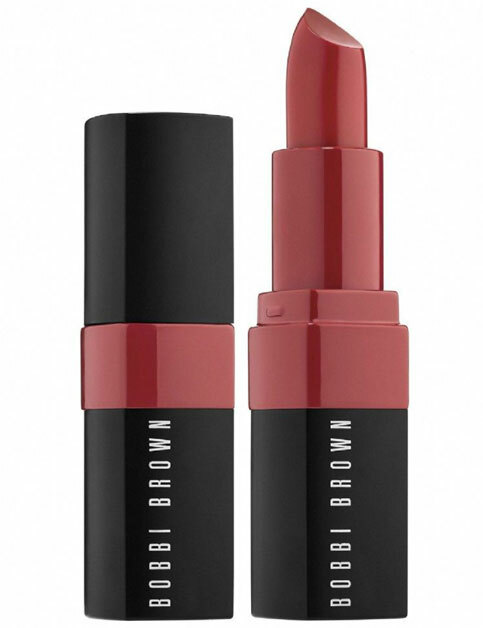 For Khrystyna’s lips, I used Bobbi Brown, (a matte looking) Crushed Lip Color—Bare. 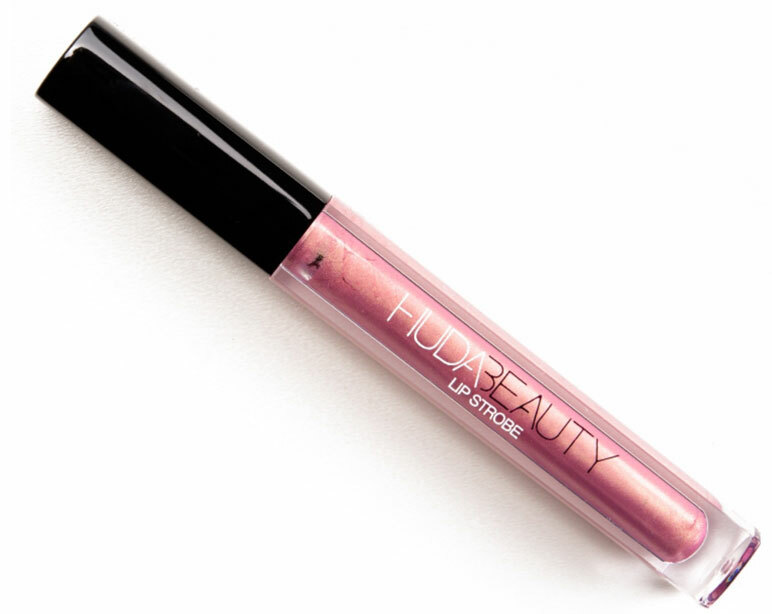 Then for the halo of upper and bottom lip, I used Huda Beauty—Angelic, lip strobe. By adding a shimmering floral highlight to the center, it projects the illusion of fuller, luscious lips. To give Khrystyna’s skin a dewy look, I applied Mac Prep + Prime – Skin Base Visage, then mixed Mac Strobe cream into her customized foundation, Makeup Forever HD. Next, to compliment her eyes and floral headpiece, I applied different highlighters; opal and a floral rose/gold on top of each other. 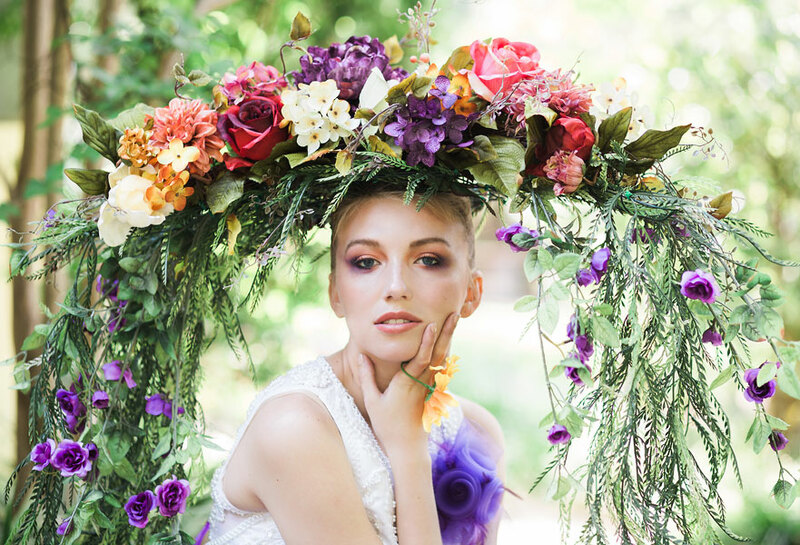 This Avant-Garden floral photo shoot was so much fun! I know we all get busy and sometimes our makeup routine looks like a predictable uniform; always the same… This summer, shakeup it! 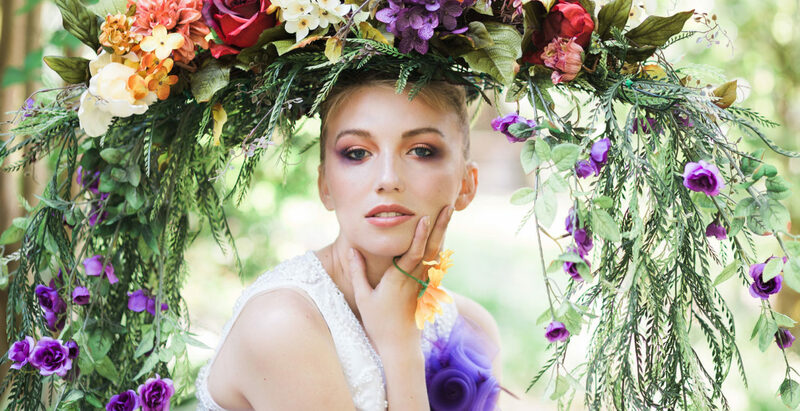 Get inspired by the colors of nature–flowers, the ocean, sunsets, earth tones from the sand, rocks and the desert. 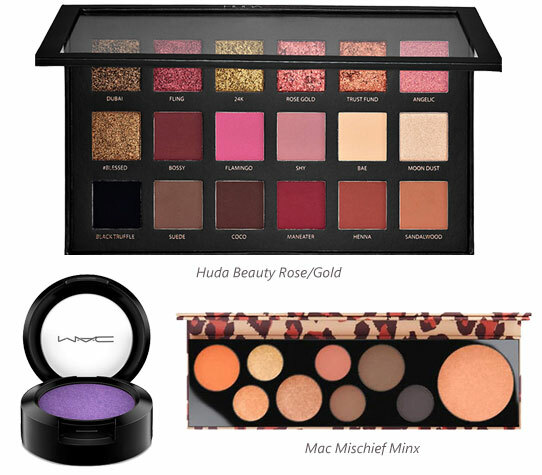 Have fun with your eyeshadow color pallets and try something new. 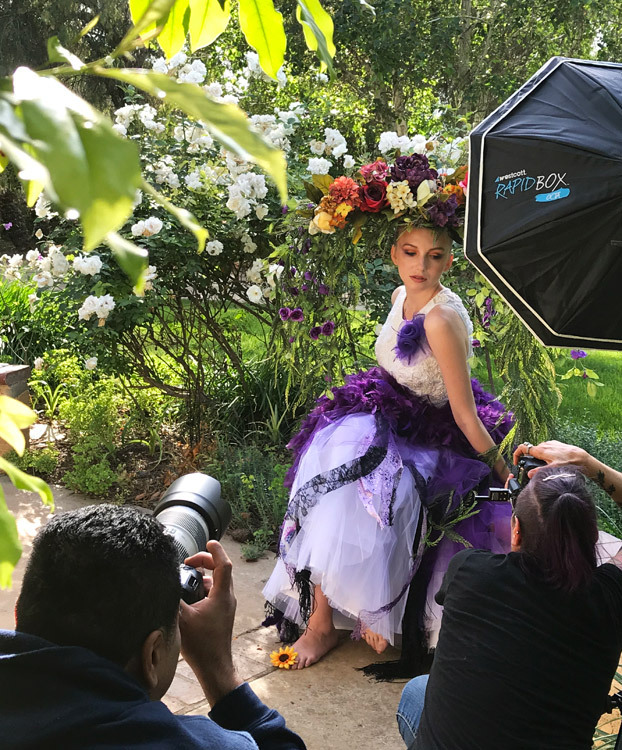 Here is a video clip with beautiful Khrystina balancing the somewhat heavy floral headpiece, ready to shoot.